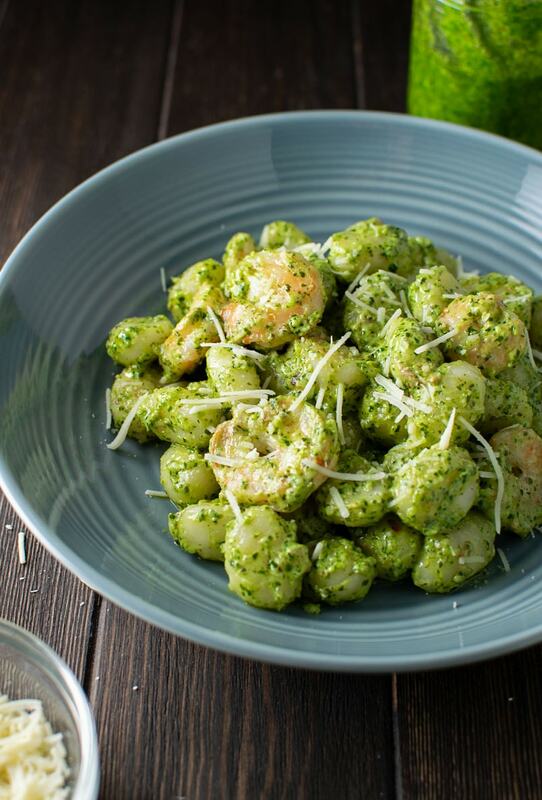 Pesto gnocchi with shrimp (pronounced nyawk-kee — I always want to say it phonetically), was of course inspired by Italy. 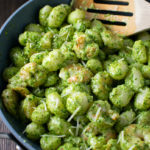 Duh, you’re probably thinking, however the first time I experienced gnocchi and pesto together was IN Italy. 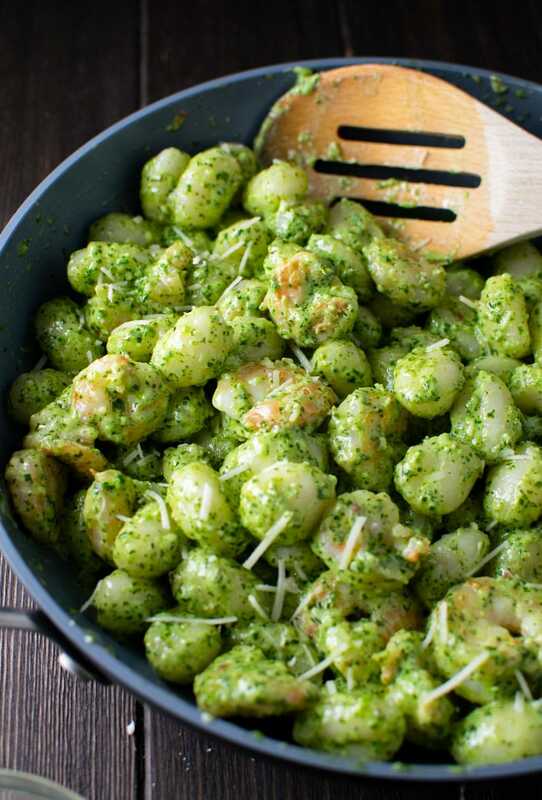 Sure I’ve had pesto 1,000 times…and who doesn’t love a hearty dish of gnocchi? Such a simple dish, but so delicious. That’s the interesting thing about real Italian cooking. 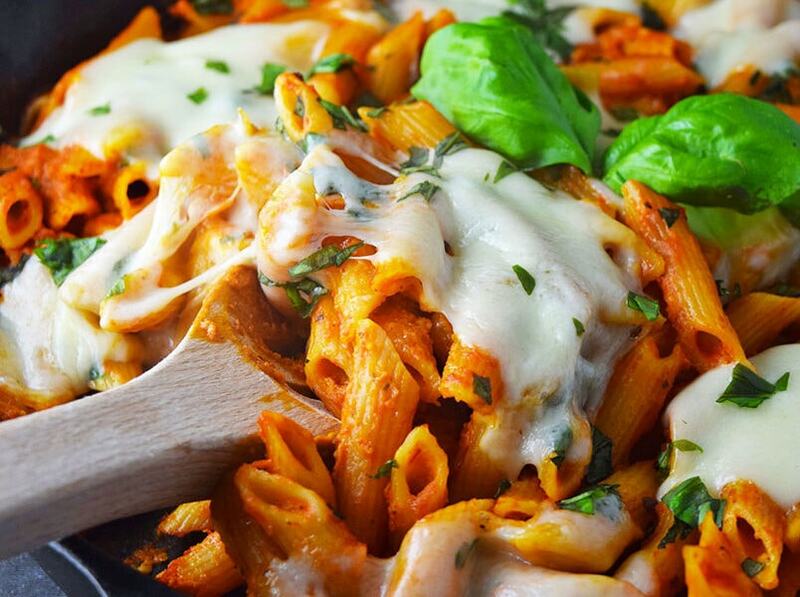 The pasta/pizza recipes are so simple. 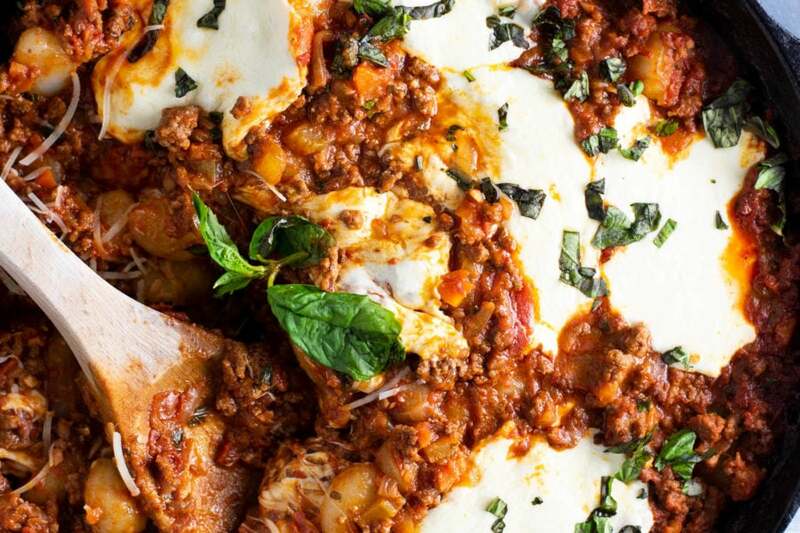 No chicken parm, no lasagna, just simple dishes with an emphasis on the pasta and a well-crafted sauce. Pesto gnocchi was served to us on a hiking tour through the villages of Cinque Terre, Italy. We stopped for lunch at Ristorante Cecio in Corniglia, just before embarking on the longest part of the hike. The restaurant paired this dish with an “optional” citrusy white wine for those of us who weren’t taking the hiking portion too seriously. I put optional in quotes because you’re out of your mind if you’re turning down any wine in Italy, no matter the time of day. The dish was exceptional. 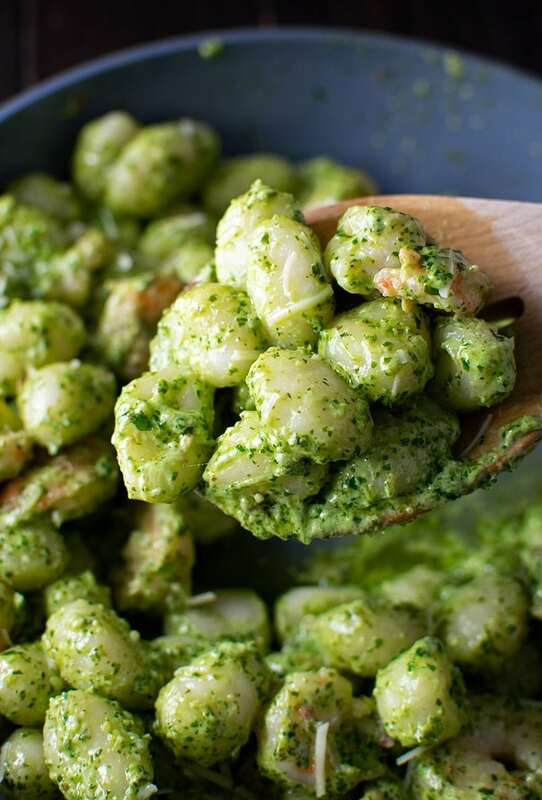 Homemade pesto and freshly made gnocchi. Of course, homemade gnocchi is time consuming and not always an option, so for simplicity I usually opt for store bought. 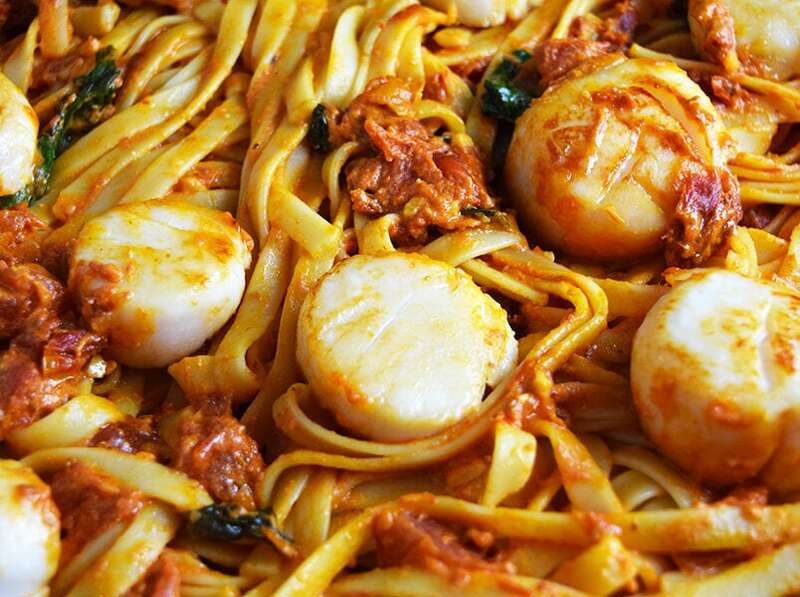 It’s still delicious and allows you to quickly pull together an authentic Italian dish during the week. My only rule, one shortcut you cannot take is buying pesto premade, unless it’s very fresh from a local deli or shop. Homemade pesto is very easy to make in a food processor or blender and it’s much more flavorful than anything you can buy in the grocery store. Take my word for it, if you want to make this dish right, take the extra 15 minutes to make your own pesto. It will also spread much easier throughout your pasta or gnocchi without clumping up. For the last step and my own special touch, I added a little cream to add a bit more of a creamy texture to the dish. You can easily substitute chicken for shrimp if you prefer or leave out the protein altogether if you want to simplify things even more. 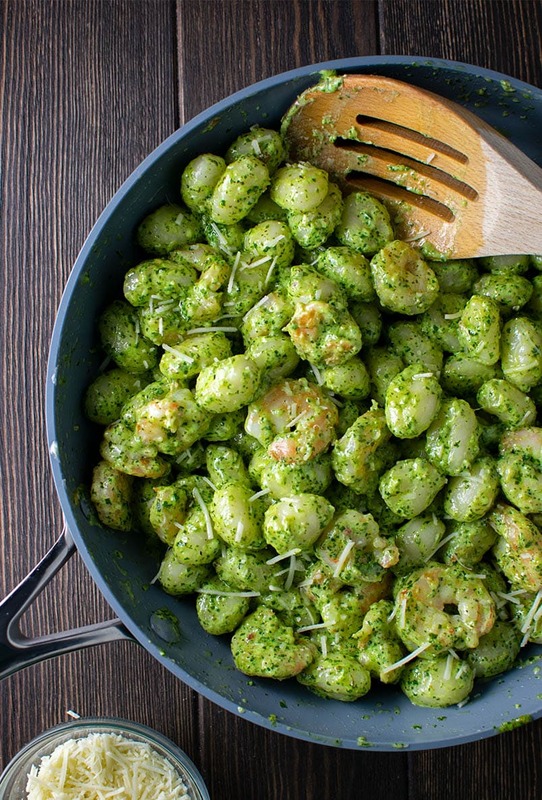 Pair pesto gnocchi with your favorite Italian white wine and enjoy.